application: IHC. Indirect immunolabeling of PFA fixed rat hippocampus (CA1) treated with pepsin prior labeling. Western blot analysis of rat brain lysate: 1. Anti-NMDAR1 (GluN1) (extracellular) Antibody (#AGC-001), (1:600).2. 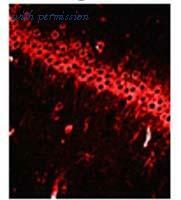 Anti-NMDAR1 (GluN1) (extracellular) Antibody, preincubated with the control peptide antigen. Western blot analysis of rat brain lysate (lanes 1 and 3) and mouse brain lysate (lanes 2 and 4): 1.2. Guinea pig Anti-NMDAR1 (GluN1) (extracellular) Antibody (#AGP-046), (1:200).3.4. Guinea pig Anti-NMDAR1 (GluN1) (extracellular) Antibody, preincubated with the control peptide antigen. 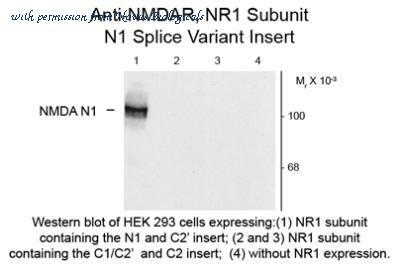 Detection of GRIN1/NMDAR1 C2 Splice Variant by Western Blot Western blot of HEK 293 cells: Lane 1 - HEK Cells without NR1 expression (Mock); Lane 2 - NR1 subunit containing only the C2 Splice Variant; Lane 3 - NR1 subunit containing the C1 and C2' Splice Variant; Lane 4 - NR1 subunit containing the N1 and C2' splice variants. Specific immunolabeling of the approximately 120 kDa NR1 subunit of the NMDA Receptor containing the C2 Splice Variant in lane 2 only demonstrates specificity for the C2 Splice Variant. 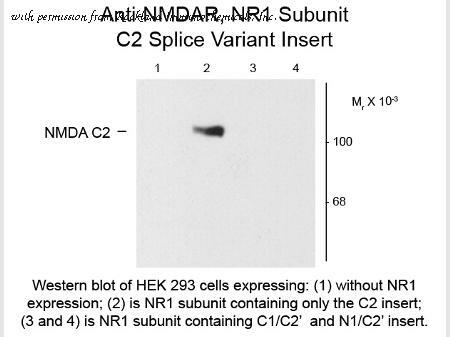 Detection of GRIN1/NMDAR1 C2' Splice Variant Western blot of HEK 293 cells: Lane 1 - HEK Cells without NR1 expression (Mock); Lane 2 - NR1 subunit containing only the C2 Splice Variant; Lane 3 - NR1 subunit containing the C1 and C2' splice variants; Lane 4 - NR1 subunit containing the N1 and C2' splice variants. Specific immunolabeling of the approximately 120 kDa NR1 subunit of the NMDA Receptor containing the C2Æ Splice Variant in lane 3 and 4 only demonstrates specificity for the C2' splice variant. 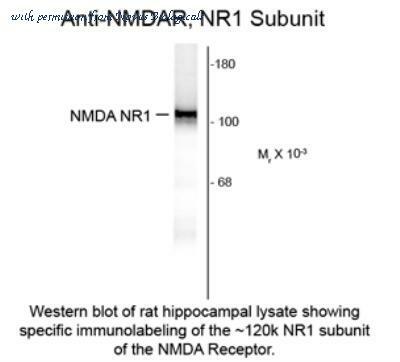 Western blot analysis of GluN1-NR1 in rat brain membrane tissues, using a 1:1000 dilution of GRIN1 / NMDAR1 antibody. This image was taken for the unconjugated form of this product. Other forms have not been tested. 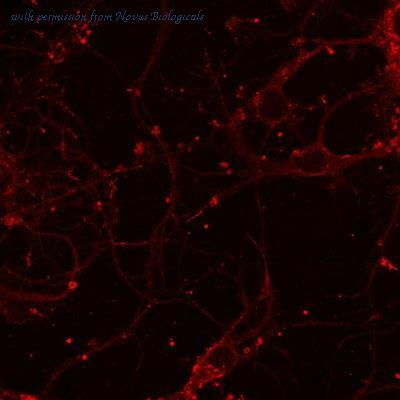 Immunofluorescence: NMDAR1 Antibody (R1JHL) [NB300-118] - Mouse neuron stained with anti-NMDAR1 antibody. Image from verified customer review. Western Blot: NMDA receptor N1 Antibody [NB300-114] - 10 ug of HEK 293 cells expressing: Lane 1 - NR1 subunit containing the N1 and C2' Insert showing specific immunolabeling of the ~120k NR1 subunit of the NMDA receptor containing the N1 splice variant insert. ; Lane 2 - NR1 subunit containing only the C2 Insert; Lane 3 - NR1 subunit containing the C1 and C2' Insert; Lane 4 - without NR1 expression (Mock). 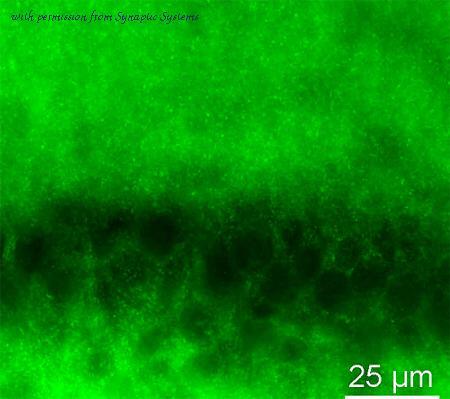 Immunohistochemical staining of rat spinal tissue cord tissue using NMDAR1 antibody. 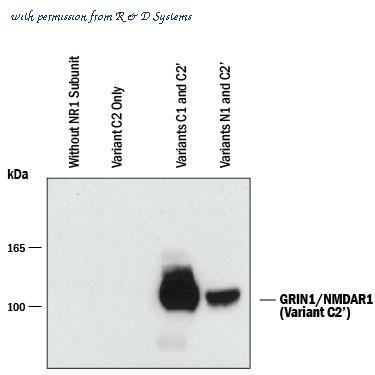 Western Blot of Rabbit anti-NMDA R1, Splice Variant C1 antibody. Lane 1: HEK 293 cells without NR1 expression (Mock). Lane 2: HEK 293 cells expressing NR1 subunit containing only the C2 Insert. Lane 3: HEK 293 cells expressing NR1 subunit containing the C1 and C2' Insert. Lane 4: HEK 293 cells expressing NR1 subunit containing the N1 and C2' Insert. Load: 10 µg per lane. 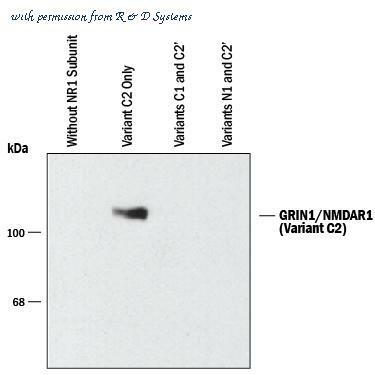 Primary antibody: NMDA R1, Splice Variant C1 antibody at 1:1,000 for overnight at 4°C. Secondary antibody: IRDye800™ rabbit secondary antibody at 1:10,000 for 45 min at RT. Block: 5% BLOTTO overnight at 4°C. 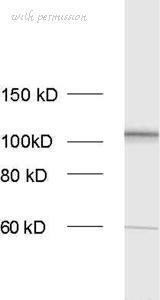 Predicted/Observed size: 120 kDa for NMDA R1, Splice Variant C1. Other band(s): none. Western Blot of Rabbit anti-NMDA R1, Splice Variant C2 antibody. Lane 1: HEK 293 cells without NR1 expression (Mock). Lane 2: HEK 293 cells expressing NR1 subunit containing only the C2 Insert. Lane 3: HEK 293 cells expressing NR1 subunit containing the C1 and C2' Insert. Lane 4: HEK 293 cells expressing NR1 subunit containing the N1 and C2' Insert. Load: 10 µg per lane. 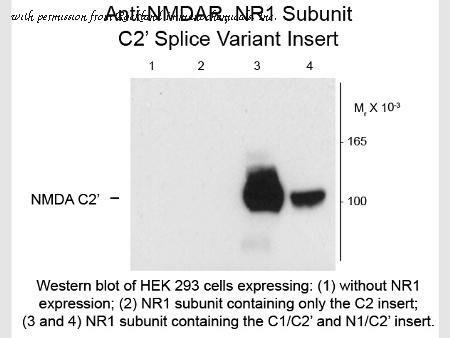 Primary antibody: NMDA R1, Splice Variant C2 antibody at 1:1,000 for overnight at 4°C. Secondary antibody: IRDye800™ rabbit secondary antibody at 1:10,000 for 45 min at RT. Block: 5% BLOTTO overnight at 4°C. Predicted/Observed size: 120 kDa for NMDA R1, Splice Variant C2. Other band(s): none. Western Blot of Rabbit anti-NMDA R1, Splice Variant C2' antibody. Lane 1: HEK 293 cells without NR1 expression (Mock). Lane 2: HEK 293 cells expressing NR1 subunit containing only the C2 Insert. Lane 3: HEK 293 cells expressing NR1 subunit containing the C1 and C2' Insert. Lane 4: HEK 293 cells expressing NR1 subunit containing the N1 and C2' Insert. Load: 10 µg per lane. 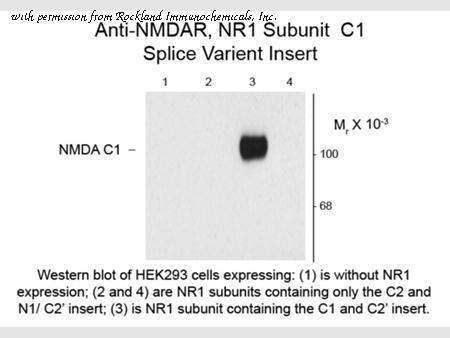 Primary antibody: NMDA R1, Splice Variant C2' antibody at 1:1,000 for overnight at 4°C. Secondary antibody: IRDye800™ rabbit secondary antibody at 1:10,000 for 45 min at RT. Block: 5% BLOTTO overnight at 4°C. Predicted/Observed size: 120 kDa for NMDA R1, Splice Variant C2'. Other band(s): none.